Volumetric Technologies provides the highest quality manufacturing equipment in the food-processing and industry for high-speed, high-quality filling and depositing. Catering to a wide variety of industries, we manufacture filling equipment for the food, dairy, cosmetics, and bakery industries. Volumetric Technologies filling line equipment is fully customizable according to your product, packaging and business needs. We’re experienced, agile, and leading the way in packaging equipment production. Our machinery solutions, including filling lines, cup machines, transfer pumps and nozzles, operate at an extremely efficient rate, with ease of use, precision and accuracy, for a precise, clean fill, every time. Volumetric Technologies filling lines and cup machines are made from 316L stainless steel and other top quality USDA/FDA materials, with a completely tool free design, as we know cleanliness and precision is a top priority for your business. Liquid filling machines deliver maximum fill accuracy, at high speeds of up to 100 deposits per head, per minute. Not only are our machines fast but they feature best-in-class reliability. The filling line machines are user friendly and ideal for filling a variety of products into multiple types of containers. 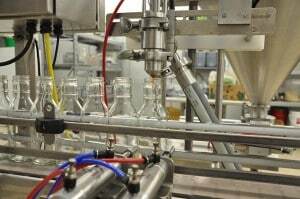 The machines feature several optional add-ons, including liquid control levels, hoppers, a variety of nozzles, and much more, so your machine can be configured for the unique needs of filling your products Our pail filling machines are net weight fillers that are designed to precisely fill pails with product, such as food, chemicals, and cosmetics, by net weight. Net weight pail filling machines have a variety of servo controlled pump options, so we can select the perfect pump needed for filling your products. We also manufacture the highest quality inline, rotary, and custom cup machines in the industry. The cup filling machines are perfect for food, dairy, and cosmetics products. These machines can denest, fill, seal, and lid your stackable containers with reliability, accuracy and speed, at 50 cups per minute. Our custom cup packaging machine is equipped with a PLC solid state controller and servo drives, which are easily configurable for your products and containers. Just like our liquid filling machines, we are proud to boast that our cup filling machines promise a perfect fit, every time. Volumetric Technologies produces the highest quality filling machines in the food-processing industry, and were proud to be American based, operating out of Cannon Falls, Minnesota. Our products are built to last, easily configurable, and user friendly. We are the leader in the industry for filling machines, with an emphasis on speed, efficiency, and safety at the same time. If you are looking to maximize your filling process, Volumetric Technologies equipment solutions are the perfect fit for your business.